Obama: "We are looking at possibility of limited narrow act that helps make sure that #Syria understands world will maintain ban on #CW"
US Secretary of State John Kerry begins his statement, 27 minutes late. Kerry says the US knows that the Assad regime, with the largest chemical weapons stock in the Middle East, has used them “several times this year”, albeit it on a smaller scale than before this year. He says that the Assad regime, frustrated with its inability to control the Damascus suburbs, chose to act. He says that the US knows that Assad personnel were on the ground three days before the attacks to scout out the terrain, that the US knows orders were given to Syrian forces to don gas masks, and that the attacks came from regime-controlled areas. “We know it was ordinary Syrian citizens who reported all these horrors” when the attack occurred. Kerry intersperses what the US “now knows” — including at least 1,429 killed in the attacks, with at least 426 children among the toll — with the emotional description of children dying and first responders grasping for breath. He says the US knows “a senior regime official” discussed the attack and its aftermath. Kerry continues with the allegation that the regime shelled the Damascus suburbs for four days to “destroy evidence” before agreeing to access by UN inspectors — and that access was “controlled”. Kerry uses the phrase “high confidence” to describe the findings of the intelligence community. He then warns about lessons from history of the consequences of inaction and silence. Kerry goes into a long passage on “why it matters” if the US and others act. He emphasizes “credibility” and the lesson drawn by other deviant states if the US does not intervene against “a thug and a murderer, Bashar al-Assad, who gasses his people with impunity”. Others, he says, “will believe they can do what they will” if the US takes no action — he cites Iran, North Korea, Hezbollah, and “every other terrorist group that might contemplate the uses of weapons of mass destruction”. “We are the United States of America. We are the country that has always tried to honor a set of universal values. This crime against conscience, this crime against humanity, this crime against the norms of the international community matters to us. Kerry insists, “The world is speaking out and many friends are ready to respond” if the US acts, claiming backing from the Arab League, the Organization of Islamic Cooperation, Turkey, and France. He says the US has great respect for the United Nations, but notes that the UN investigation does not have the mandate to affirm who carried out the chemical weapons attack. Because of that and “Russian obstructionism”, the “UN cannot mobilize the world”. He notes the difficulties post-Iraq War but “fatigue does not absolve us of our responsibilities”. This short, English-subtitled video, filmed on Thursday, shows a family whose members have all been killed by a regime artillery strike on the East Ghouta town of Muadamiyyat Ash-Sham. The insurgent-controlled town is one of the sites in the Damascus suburbs hit by chemical weapons strikes on August 21, and the regime has subjected it to heavy shelling, artillery and airstrikes since then in an attempt to capture it. The regime stopped the bombardment only for a few hours this week to allow UN weapons inspectors to enter the town, where they stayed for 90 minutes. The video shows local residents taking the family for burial. UN Inspectors Already Out of Syria? Reports are circulating that some UN inspectors — officially scheduled to depart Syria on Saturday morning — have already left the country headed for the Lebanese capital Beirut. While the location of the inspectors is not known — and for security reasons is unlikely to be divulged — it is likely that the information they have collected in East and West Ghouta has already been transferred out of Syria and has been received by the U.S. and other countries, in addition to intelligence about the August 21 attacks provided by those countries’ intelligence services. The signals from the U.S. and Turkey on Friday strongly indicate that Washington and its allies are confident about what that intelligence will prove and/or indicate. The White House has informed the press that US Secretary of State will make a formal statement on Syria at 12.30 pm EDT (1630 GMT). The White House said that it will also release a declassified version of its intelligence assessment of the August 21 chemical attacks in Damascus. Turkey’s Foreign Minister, Ahmet Davutoglu, told reporters on Friday that Turkish intelligence has proved that the Assad regime carried out the August 21 chemical attacks in East and West Ghouta. Davutoglu added, from our point of view and based on the assessments of our national intelligence, Syrian regime is no doubt responsible for the chemical weapon attack. “The international community shoulders the responsibility from now on,” Davutoglu highlighted. The information which was obtained by eyewitnesses, footage, agents of health organizations has clearly shown that there was a chemical attack as the victims died because of the asphyxiation by gas effect as they did not have any scars or bleeding. Stating that some circles tried to accuse Turkey of calling for war in Syria, Davutoglu said, Turkey from the beginning was calling on the international community for an effective response. “For us, the main issue is Turkish public’s security (regarding intervention against Syria),” Davutoglu added. that the regime used the missiles of FROG-7/Luna and/or M600. In Qasyoun, 220 ​​mm rockets with 15-70 km-range were estimated to be used"
#LIVE Turkish PM Erdogan: "UN and Arab League have not done their part on Syrian chemical attack"
And Foreign Minister Ahmet Davutoglu has declared this afternoon that the “Syrian regime is responsible for chemical attack in East Ghouta” near Damascus. After almost two months without Friday protests, demonstrators in Kafr Nabel in Idlib Province returned to the streets today with large banners. 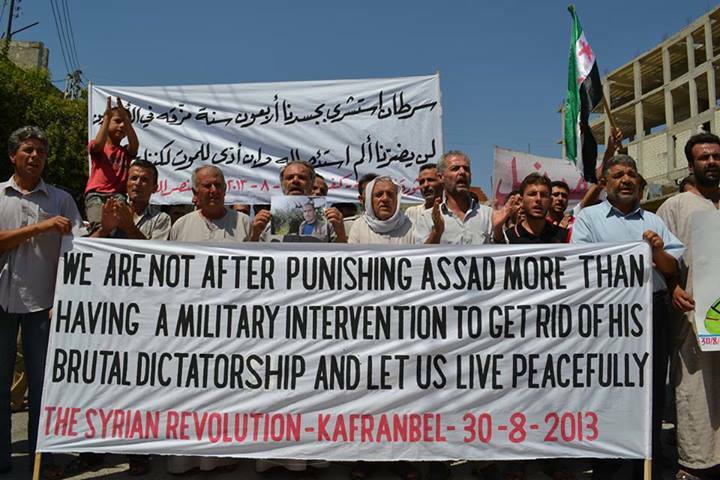 The slogans included: “We are not after punishing Assad, more than having a military intervention to get rid of his brutal dictatorship and let us live peacefully”. Others held a banner reading “Hit Assad down, let Syria shine”. Russian President Vladimir Putin has welcomed the vote by Britain’s House of Commons to reject military action against Syria. He added, “It seems to me that people are starting to understand how dangerous such scenarios are,” and that any strikes without UN Security Council approval would “deal a serious blow to the entire system of world order”. Claimed footage from Friday of homes in Muadamiyyat Ash-Sham hit by regime tank shelling. Claimed footage posted on Friday shows homes in Darayya in the Damascus suburbs, burning after heavy regime shelling. Regime forces have shelled Darayya and nearby Muadamiyyeh Ash-Sham in West Ghouta — one of the sites of the August 21 chemical weapons attacks — as part of an offensive to retake insurgent-held Damascus suburbs. That offensive began with the chemical weapons strikes in East and West Ghouta. UN inspectors now with wounded Syrian soldiers. Went in with big case of equipment – for testing? Responding to Britain’s vote against military action, French President Francois Hollande has stated that it will not impact France’s will to punish the Assad regime for its apparent use of chemical weapons against civilians. In an interview with Le Monde, Hollande declared that he still supported taking “firm” punitive action” in response to the “irreparable” harm to the Syrian people caused by the chemical attack. “All the options are on the table. France wants action that is in proportion and firm against the Damascus regime,” the president added. Footage from Friday shows extensive destruction to residential neighborhoods in Muadamiyyah Ash-Sham. The regime has continued its offensive against the West Ghouta town — including airstrikes and heavy artillery shelling — since August 21, when it was hit by a chemical weapons attack. The regime stopped shelling on for several hours only to allow UN inspectors access to the town, saying that the airstrikes “protect civilians”. He said that “strikes can paralyze a large part of the regime and raise morale” within the opposition. The regime has launched fresh airstrikes on Muadamiyyeh Ash-Sham in West Ghouta, the site of one of the August 21 chemical weapons strikes, amid clashes between regime forces and insurgents. The regime is trying to take the town in an offensive that began with the chemical weapons strike. Activist Razan Zaitouneh, who runs the Violations Documentation Center in Syria, [said] her team sped to the Damascus suburb of Zamalka immediately after a chemical weapons attack was reported there on Aug. 21. The media staff of Zamalka’s local coordination committee, which is responsible for filming videos in the area and uploading them to the world, also sped to the scene. According to Zaitouneh, all but one of them paid with their lives. Italy appears to be stepping back from any involvement in a military intervention, following remarks by Foreign Minister Emma Bonino in a CNN interview. While denouncing chemical weapons as a crime against humanity” and saying those responsible for last week’s attacks near Damascus “have to be brought to be accountable”, Bonino asserted that it is not “wise” to intervene without United Nations Security Council approval. On Thursday, Syria’s ally Iran played up Bonino’s scepticism, claiming she had told Iranian Foreign Minister Mohammad Javad Zarif of her opposition to intervention. A BBC team inside Syria documents one of the “everyday” regime attacks, an airstrike with incendiary weapons — a “napalm-like” substance or thermite — that killed at least 10 students. The Pentagon is moving a fifth warship armed with cruise missiles to the eastern Mediterranean Sea, a US defense official has said. The guided-missile destroyer Stout was expected to arrive in the area Thursday. Each of the five warships can carry up to 90 cruise missiles, though experts say they are likely carrying about half that number. Cruise missiles have a range of nearly 1,000 miles, allowing the vessels carrying them to stay well out of range of Syria’s anti-ship arsenal. The Local Coordination Committees claim 70 people were killed on Thursday, including 28 in Idlib Province and 17 in Damascus and its suburbs. The Violations Documentation Center put the number of dead at 71,648 since the conflict began in March 2011, an increase of 135 from Thursday. Of the dead, 54,123 are civilians, a rise of 111 from yesterday. 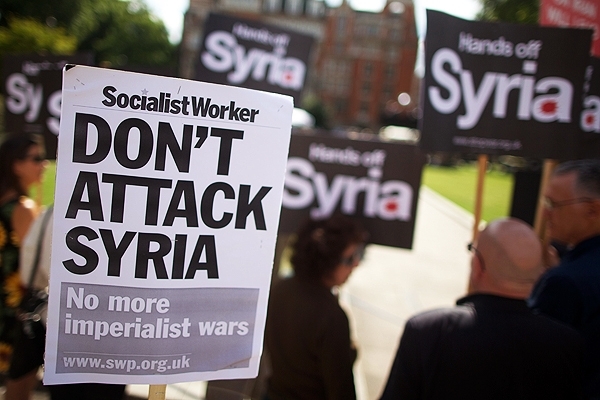 In an unexpected setback for plans for a US-UK military response to last week’s chemical weapons attack by the Assad regime, the British Parliament defeated the Government’s motion for humanitarian intervention by 285-272 late Thursday night. After more than seven hours of debate, the House of Commons dealt Prime Minister David Cameron what appeared to be a fatal blow to preparation for airstrikes. Cameron said immediately after the vote that it was clear the MPs did not want action and “I will act accordingly”. President Obama’s decision-making will be guided by what is in the best interests of the United States. He believes that there are core interests at stake for the United States and that countries who violate international norms regardng chemical weapons need to be held accountable. However, even before the developments in London, the Obama Administration appeared to be split over airstrikes, with or without partners. A group of American officials, leaking their reaction to the latest US intelligence report on the August 21 chemical weapons attacks, said the assessment was “not a slam dunk” of proof and raised a series of objections to intervention: — including the warning that US airstrikes could trigger another deadly chemical event. In contrast, “senior Administration officials”, reacting within minutes to the British setback, said the US could proceed without London or any approval from the United Nations Security Council. The five permanent members of the Council met on Thursday for the second consecutive day, with no apparent movement in position. Britain has tabled a resolution asking for the Council’s endorsement of intervention — on Wednesday, the Cameron Government had promised MPs that no action would be taken until the Council had considered the report of UN inspectors inside Syria.